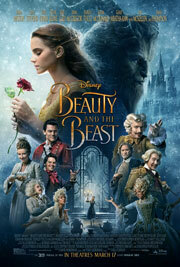 As sweet and lovely as Disney’s 1991 animated film “Beauty and the Beast” is, the story has some, um, inconsistencies. Belle somehow manages to get an injured, beaten Beast up on a horse to bring back to the castle. There is a painting of an adult Prince that could not possibly have been painted. And how is it that the local village has no knowledge of an enchanted castle just a short ride away? All of these issues, thankfully, are addressed in the live-action remake of the film, and the emotional stakes are raised quite a bit in the finale (though not in the manner that you might think). The production design is gorgeous, Belle’s yellow dress is as stunning as Cinderella’s blue dress in the 2015 remake of that film, and Emma Watson is an inspired choice to play Belle, and is quite the singer as well. The movie takes a while to find its rhythm, though. The three biggest musical numbers in the movie’s first half bite off more than they can chew, as if Disney had told director Bill Condon, “Just ask yourself: what would Baz Luhrmann do? And then ask us if we think Baz would do that, and we’ll tell you whether or not you’re right.” Condon captures the excessiveness of a Luhrmann number but not its energy, and that is a very important distinction. The movie’s second half, though, is much better. The relationship between Belle and the Beast comes into focus, and one small cameo makes a world of difference in the end. WHAT: When a progressive, hard-partying sorority (led by Chloe Grace Moretz) moves in next door and threatens to derail the impending sale of their house, Mac (Seth Rogen) and Kelly (Rose Byrne) join forces with their former adversary, Teddy (Zac Efron), to take them down. WHY: Though 2014’s “Neighbors” was a box office hit, there weren’t many people clamoring for a sequel, mainly because it didn’t feel like there was anywhere else to go with the story. That didn’t stop Universal from green-lighting this blatant cash grab, however, resulting in a sloppy, pseudo-feminist rehash of the original that follows the same beats without many of the laughs. Not only is it more unbelievable than its predecessor (nothing that happens in this film is even remotely realistic), but unlike the Delta Psi guys played by Zac Efron and Dave Franco, the sorority girls aren’t very likeable; in fact, they’re straight-up idiots with almost no redeeming qualities. Unfortunately, that extends to many of the returning characters as well. Despite his fun turn as the villain in the first movie, Efron is wasted as the emotionally stunted sidekick, while Seth Rogen and Rose Byrne seem to be on auto-pilot. There are a few giggles here and there, but for the most part, “Neighbors 2” is a giant waste of talent and, more importantly, your time. EXTRAS: In addition to an audio commentary by director Nicholas Stoller and producer James Weaver, there’s a making-of featurette, a behind-the-scenes look at filming the tailgate sequence, deleted scenes, alternate takes, a gag reel and more.